It’s a dream come true for me! Yes, it’s a dream come true to see our youngsters leading a grand protest against the ban on our traditional sport, Jallikattu, the bull catching festival celebrated during the Pongal festival. People generally have a thought that youngsters are useless and careless about anything but the revolution broke today, supporting our traditional sport and rights transformed the perception, indeed. Nothing survives without struggle and here’s a voluntary movement, for not a political reason but to sustain our identity and strengthen the chord of Tamils that was tightening by the cord from the centre govt. and neighbourhood states. First time a protest (statewide Tamil Nadu) without the involvement of any political party or cine personalities! Hats off guys, I am quite with you all. The Supreme Court has banned Jallikattu following the case filed by Peta, a foreign based animal rights organization, which reasons to ill-treating bulls. For every eye that watches the Jallikattu might think of it but the reality was the bulls are worshipped here and treated like their very own kid. Coming from a family that based on milk business and rearing cows, I know how they are treated and many a time my grandparents have skipped their meals but never cows hunger. And also haven’t attended many functions only because they have to take care of them. At villages things used to be more fine towards the wellness of cattle’s and bulls, and Jallikattu is a way of celebrating bravery and exhibit of bovine strength. The trained bull catchers try to control them for less than a minute mostly and let free. 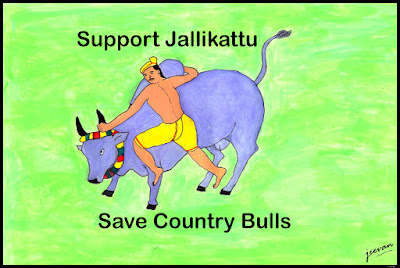 I am so amazed to hear that Jallikattu has been around for 4000 years! So they cannot be wrong that this Jallikattu culture should carry on. 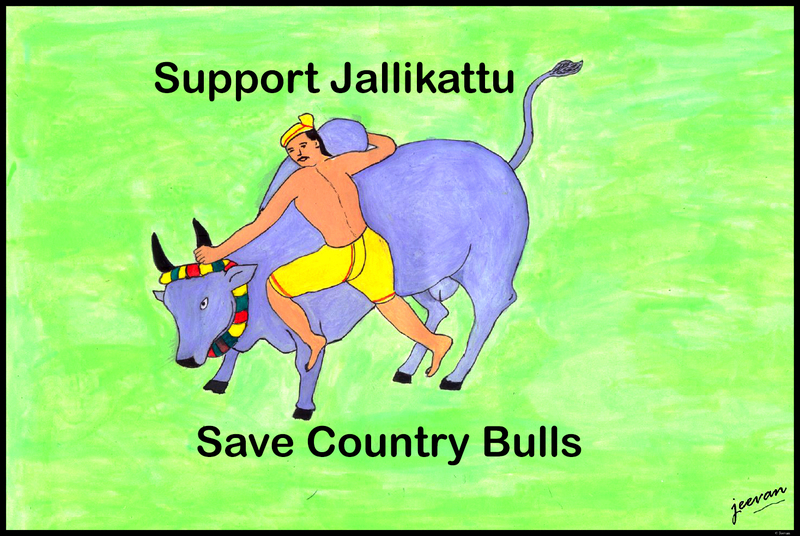 Support Jallikattu! Did you do the painting? It is beautiful! Yes, PETA hasn't got any right to interfere here in this game. But I would like people to protest with this vigour for our farmers' suicide too. Many be some people ill treat them...not sure! But if there is no such reason to believe, i guess the protests were valid. Sandhya - Yes, it was painted by me... but about 6 years back! I believe this protest will also support farmers and it shouldn't stop here and people should continue protest for anything that's against people, only then the authorities/politicians will be cautious before taking any step. What I find interesting is, PETA did not ask for a ban against slaughterhouses or chicken/diary farms where animals are actually treated badly, but they want a ban against only this sport where more humans are injured than bulls! It's great that the young care about your traditions and are willing to protest for what they believe! I never knew about this sport, but if the animals are treated in the right manner then there is certainly no reason to protest. Absolutely love that painting, I hope to see more of them!